I went to the Khar station fish market on Saturday as my mother is visiting us these days. She likes her daily quota of fish. River water fish of course as she is Bengali. 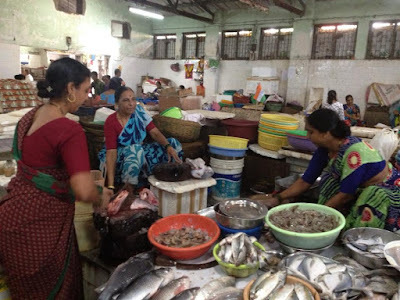 While there are a few options, such as Cambay Tiger in Bandra or Gourmet Delight (a website), from where one can order fresh-water fish online or on the phone, I prefer to go to the market when I can, even it gets hot and grimy there. That way I can see the size of the fish I am buying and the way it is cut. The latter is very important to me. The shop I go to at the Khar Station Market is run by two sisters, Poonam and Sangeeta. Their mother, Hira Bai, sits with them too, and it is she who had opened this shop 40 years back. The ladies belong to the Koli community. They go to Crawford Market and Sassoon Dock Markets every morning to buy fish from the wholesale market and then come and sell it at Khar. Their hours of operation from 10 am to 1 pm and then 6 to 8 pm. Khar market has a number of ladies selling fish and most have their set of loyalists and regular customers. I was planning to buy rui (rohu) from the market for ma and found a decent sized one. 2.5 kg. There was caatla or katla too. I prefer kaatla as I find it tastier. My mother is a more disciplined eater and goes for the rui as it has less fat. Which is why I picked up the rui for mom and some rawas (Indian salmon) fillets for K and me. Then I saw a decent sized ilish or hilsa, a fish that us Bengalis love. I know that my mother loves it. As do K (my wife, a Parsi) and I. Ilish is expensive and costs about Rs 1100 odd a kilo here. As it does in Delhi 's CR Market according to a recent Facebook upload by journalist Kanchan Gupta. The crucial thing about ilish is the size. The ones that weigh more that at least a kilo are preferred and are more expensive too. Smaller ones are too bony. I recently got a largish ilish sent home by Gourmet Delite and had cooked some for my mom. At that time, friends told me, the local Mumbai markets had only small (500 g, 700g) ilish. I was glad to see 1 kilo plus ilishes at Poonam's on Saturday. She assured me that it was 'Kaal-cutta' ilish and not the local one which is called bheeng. My late father in law, a Parsi, was fond of that. However, the local ilish doesn't cut much ice with my mother. 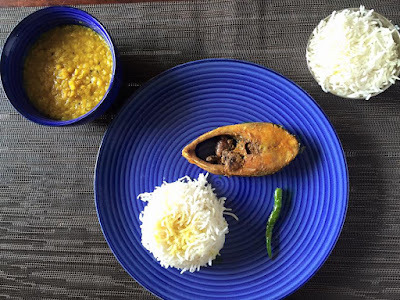 Poonam had a mix of two types of hilsa. One with roe and one without roe. Many Bengalis like the roe, as do I and as did my late father in law. No-one else at home does though. So I picked a 1.4 kg ilish without roe as this would give me for fish (flesh) and more bang for the buck. This is why I prefer going to the market myself as I can make these calls on the spot. I also requested them to slice it in a manner that each piece had a portion of petti (the stomach, with less bones) and a potion of gaada (the back, which is bony). My mother used to buy ilish for me when I would visit her in Calcutta. She would make a jhol (light curry) with the peti pieces and bhaja (fry) with the gaada. She said that frying the gaada made the bones easier to handle. I think what happens is that frying makes the fish firmer and easier to separate from the bones. 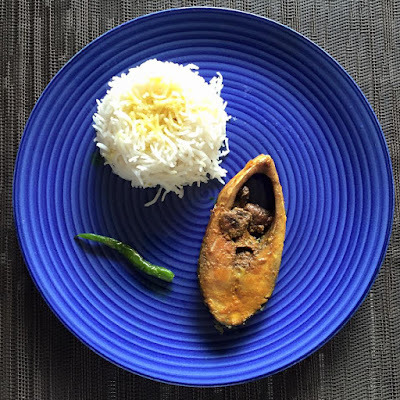 Mom would serve the fried ilish with tel. Tel in this case refers to the oil in which the fish is fried and is mixed with plain rice and eaten. Tel, in the context of fish, in Bengali could also mean the blubber/ fat (maccher tel). This is normally fried with a light batter coating and is delicious to eat. 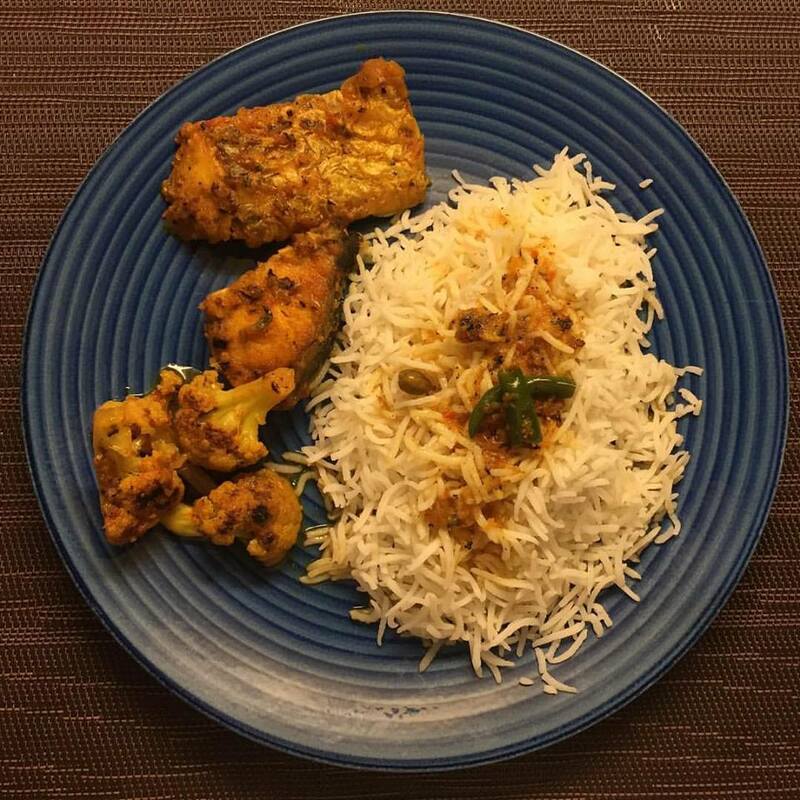 After I came back from the Khar market, I made myself some fresh rice. Unlike most other Bengalis who like short grained rice, I prefer the long grain basmati. I made some dal sheddo (boiled dal) in the micro-wave and fried a piece of ilish to go with it. I suddenly remembered the ilish machh bhaja and tel combination from my home in Kolkata and decided to add a bit of the oil from the frying pan to my lunch In Mumbai. The combo tasted delicious and the fish was very good too and made for a beautiful Bengali lunch in the middle of Mumbai's Bandra. 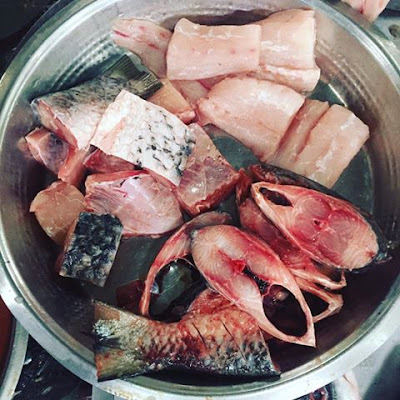 The main thing about ilish is that it should be treated very gently. It should not be over spiced. Also you have to carefully turn it while frying so that it doesn't break. If it's just the gaada, then you can deep fry it till it is crunchy. This is called 'kora kore bhaaja. If it has the peti too, and if the fish is fresh, then I would rather shallow fry it so that you can really enjoy the taste and texture of the fish to the fullest. Turn it over gently after a minute and half. Let it rest on the pan for another couple of minutes and you should be done.